Fram Strait is the largest gateway to the Arctic Ocean and the only gateway allowing deep water exchange. Atlantic water flows northward in the West Spitsbergen Current while polar water and sea ice is transported southward in the East Greenland Current. Inflowing Atlantic water is an important and variable source of heat to the Arctic Ocean; anomalies in Atlantic water temperature have been traced back far along the periphery of the Arctic Ocean and may play in important role in determining sea ice extent and thickness. The southward flux of Arctic freshwater and sea ice is of interest as fluctuations in the volume of freshwater exported affect the density of seawater in the Nordic Seas and sub-polar North Atlantic which may modulate the Atlantic meridional overturning circulation. An array of up to 15 moorings has been maintained in Fram Strait since the 1990s. The array is jointly operated by the Norwegian Polar Institute, which maintains moorings in the Arctic outflow in eastern Fram Strait, and the Alfred Wegener Institute, which maintains moorings in the Atlantic inflow in eastern Fram Strait. One of the principal goals of the Norwegian Polar Institute is to monitor the freshwater flux in the East Greenland Current and over the East Greenland Shelf. Moorings in the outflow are equipped with instruments that provide a high-resolution continuous time series of temperature, salinity, velocity and sea ice thickness. In order to record signals in the fast changing Arctic and understand the impact on the climate system it is essential to maintain continuous measurements at this key site in the Arctic Ocean in the future. Recent improvements to the array include specially adapted instruments that measure temperature and salinity just below the sea ice that covers the surface of the East Greenland Current and automatic water samplers that collect tracer samples year-round at key locations. Fram Strait is the main gateway through which sea ice leaves the Arctic Ocean. About 1% of the total Arctic sea ice volume is exported every month and melts downstream in the East Greenland Current or the adjacent Nordic seas. 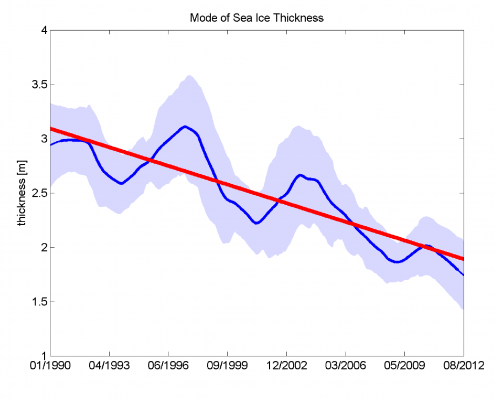 To keep the mass of sea ice in the Arctic Ocean constant, the same amount of ice needs to grow each month. Changes in the mass of sea ice exported through Fram Strait therefore affect inventory of sea ice in the Arctic Ocean. This is one of many reasons why we monitor the sea ice properties in Fram Strait. 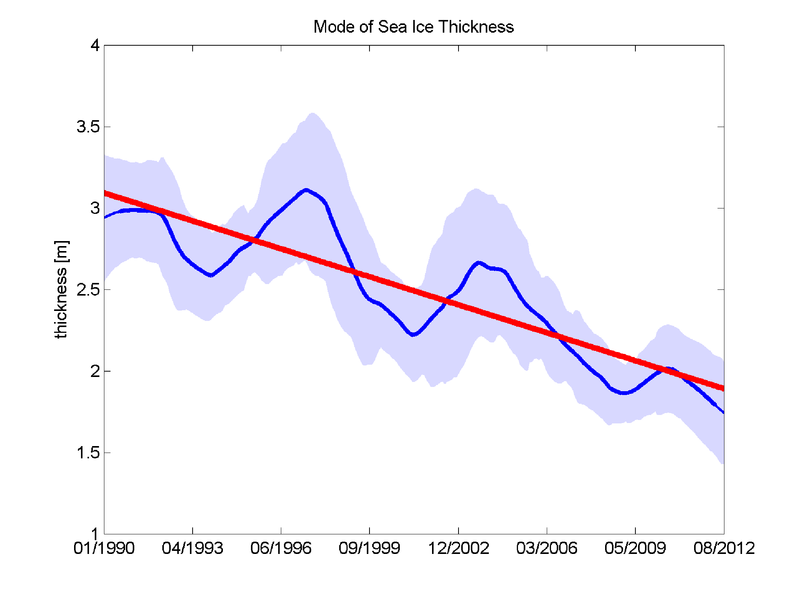 Sea ice thickness has been continuously measured by moored upward looking sonar since 1990. 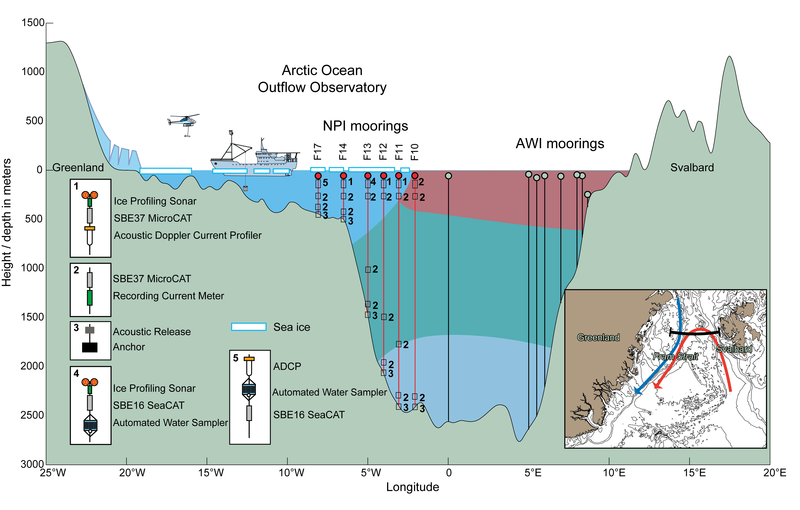 Spatial variability is monitored using ice thickness soundings from helicopter surveys and at sea ice stations which are visited annually when the Norwegian Polar Institute’s mooring array in Fram Strait is serviced. Since 1990 the thickness of level sea ice in Fram Strait has decreased by ⅓ from about 3 m to 2 m.
The Arctic outflow in Fram Strait is a key location where sources and sinks of carbon in the Arctic Ocean can be monitored. Annually repeated measurements of the carbonate system aim to quantify the volume of organic carbon exported from the Arctic Ocean and identify processes affecting the fate of carbon in the Arctic. 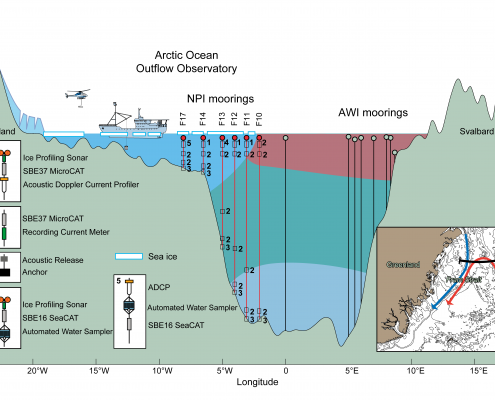 Measurements of the ocean acidification state provide important baseline data for the Arctic Ocean which will reveal changes in the saturation states of calcium carbonate. Coincident freshwater tracer measurements help to explain the causes of observed changes in the carbonate system.